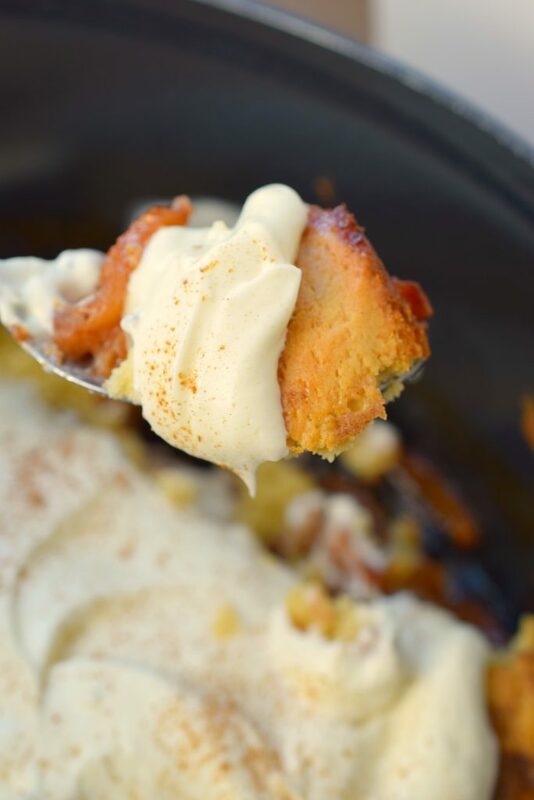 Dutch Apple Cobbler with Cheesecake Topping - Who Needs A Cape? 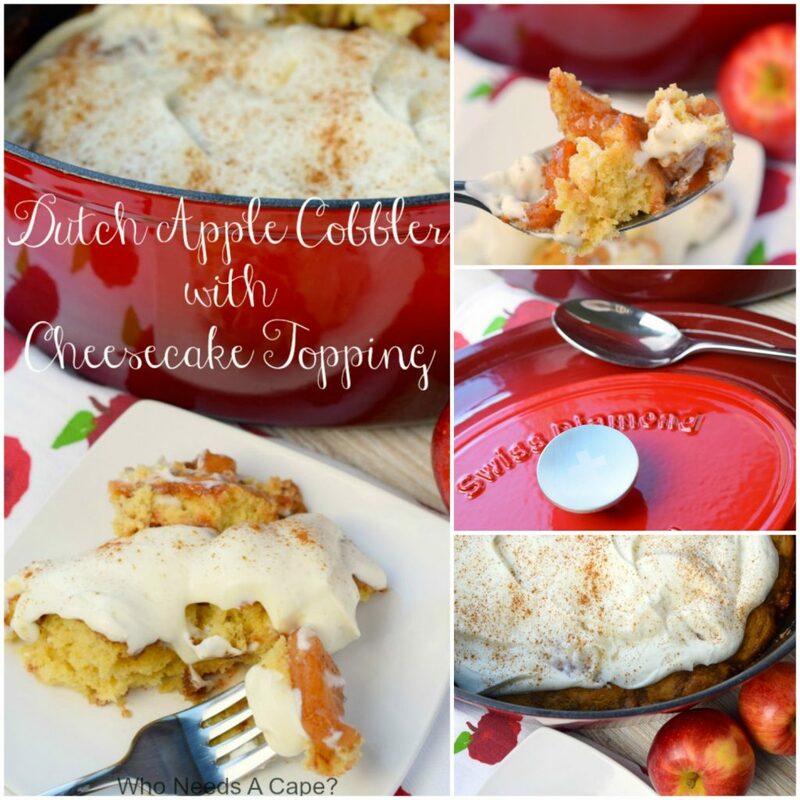 Dutch Apple Cobbler with Cheesecake Topping makes a wonderful dessert for a crowd. 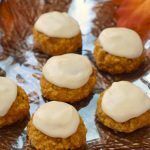 Serve for brunch or a holiday dessert, it is a tasty autumn treat. I can officially wish everyone a very HAPPY FALL! Oddly enough I look forward to fall more than any other season, even though right on its tail is winter. 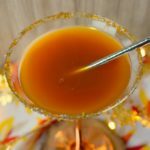 Fall is a time of beauty and amazing flavors, plus the temps are less “icky” and if you know me at all, you’ll know that sticky weather and Lori do not mix well. So bring on the cooler temps! 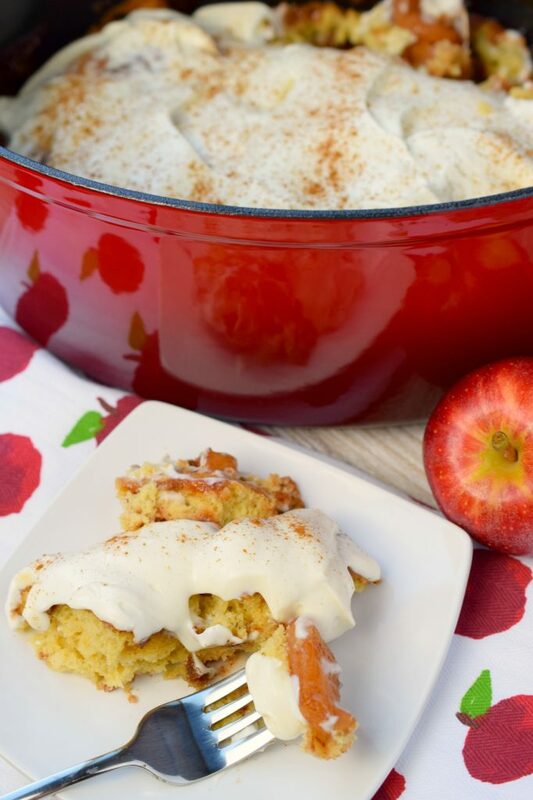 This is my first time participating in #AppleWeek, and I’m so excited to be debuting 4 brand spanking new apple recipes this week. I’m so excited to be participating! 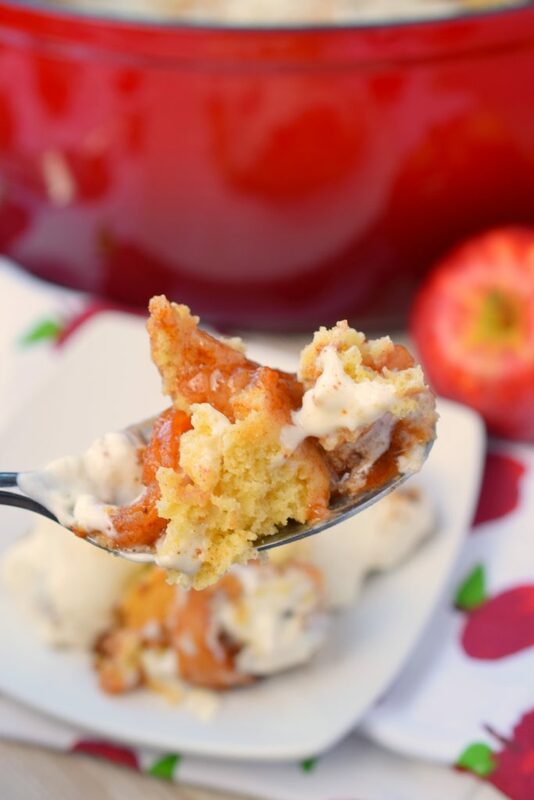 Allow me to introduce you to my first #AppleWeek recipe: Dutch Apple Cobbler with Cheesecake Topping. 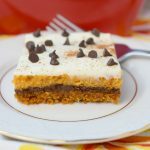 There are 4 layers to this amazing dessert. Beginning with a nice layer of baked cinnamon apples topped with a tender cobbler layer and next a crumble layer. The ending is what sets this dessert over the edge, a cheesecake topping that goes on while the cobbler is still warm. Don’t let the steps intimidate you, they are all simple and the end result is worth it, trust me. 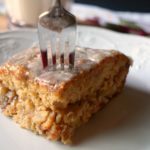 You’ll also be finding yourself making this over and over, so yummy! Now before you fret about “Is this really a cobbler, or a cake? This lady doesn’t even know!” I’ll go with its somewhere in between, the “batter” gets plopped on top of the baked apple layer and isn’t necessarily uniform. So perhaps more of “dump cake” look…truthfully I like the word cobbler vs. dump, that’s just me. I think once you’ve tasted this delightful dessert you won’t care what its called. This serves a load of people, it would make a lovely addition to weekend brunch or take it along to a chili cookoff. 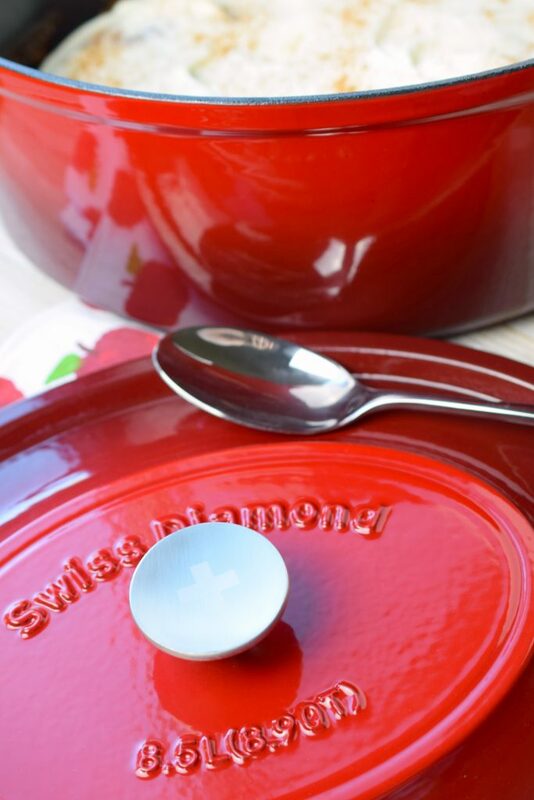 Swiss Diamond provided me with a gorgeous Swiss Diamond Cast Iron 8.9 Oval Casserole. I’m in love with the color, size, and quality of this cookware. 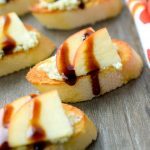 Versatile and elegant I’m delighted with this new addition to my kitchen and it made the perfect dish to use for this #AppleWeek recipe. Use whatever baking apple variety you desire. Sprinkle cut apple slices with lemon juice to avoid browning while assembling. The recipe can be made in a 13X9 baking dish. 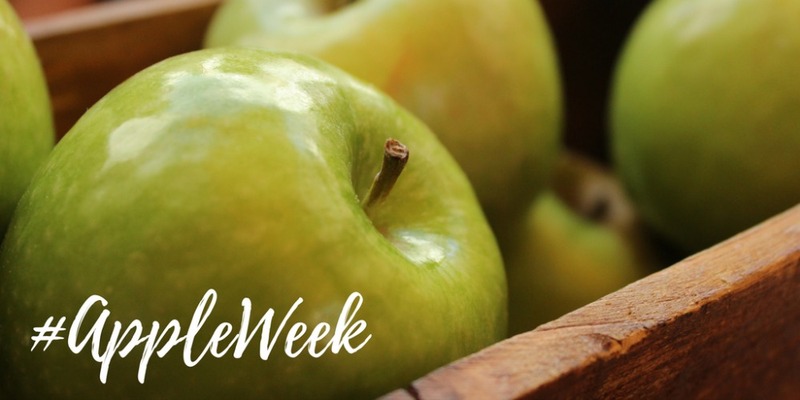 Don’t forget to scroll all the way down to see the list of today’s other participating #AppleWeek blogger recipes! Preheat oven to 400° degrees. Butter bottom of baking dish, either a large casserole or 13X9 baking pan. Set aside. Combine sliced baking apples, sugar and cinnamon. Pour into bottom of prepared pan. Bake approximately 15-20 minutes, until bubbly. Remove from oven. With electric mixer beat together butter and brown sugar. Add eggs in one at a time beating after each addition. Add to mixture: flour, salt and baking powder. Mix until thoroughly combined. 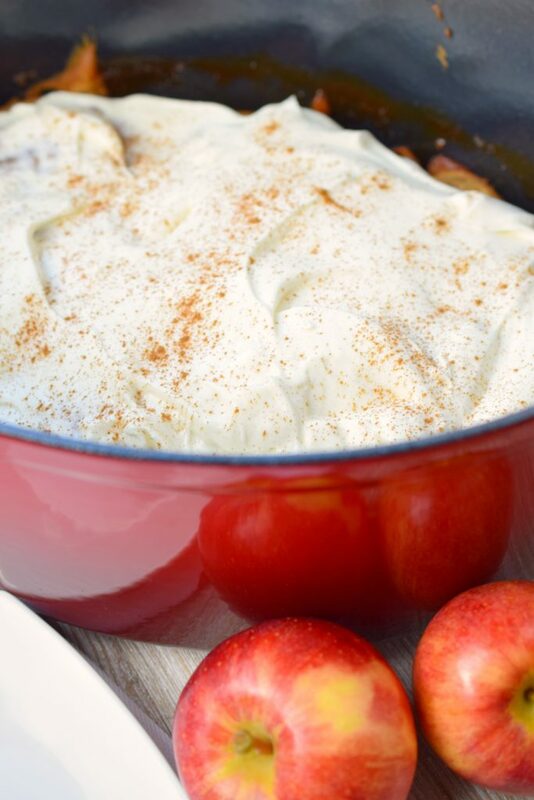 Drop batter onto apples. Set aside. In small bowl combine: butter, brown sugar, flour and cinnamon. Use a pastry cutter or two knives to cut butter into dry ingredients.Crumble mixture over top of batter layer in pan. Return to oven and bake approximately 30 minutes. The top will get browned and sides will caramelize a bit. Remove from oven and cool slightly. With electric mixer beat cream cheese until fluffy. 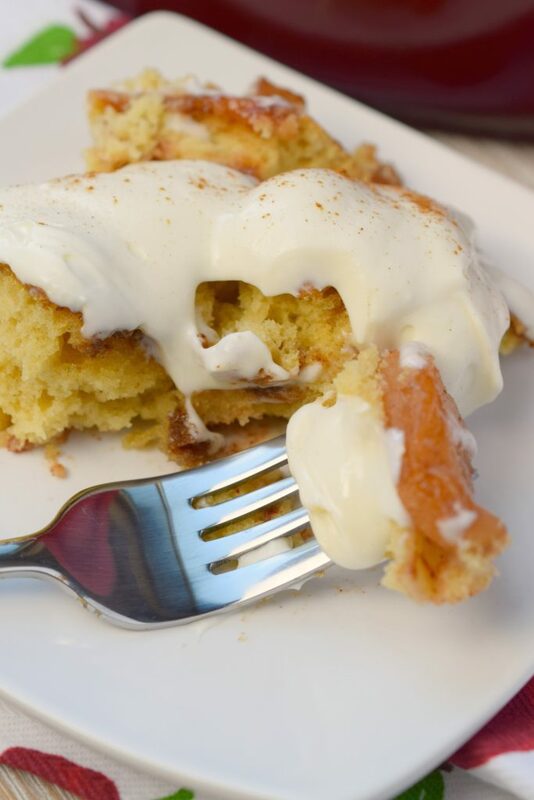 Add in heavy whipping cream, vanilla extract and powdered sugar until fluffy and creamy. Spoon over the top of warm dessert. Sprinkle with cinnmon if desired. Serve warm. This sounds so good. The cake looks delicious, but it’s that cheesecake topping that really pushes this over the edge. I need to have some friends over so that I have an excuse to make it. Cheesecake topping you say? I’m all in! 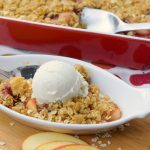 This cobbler looks amazing and I love that pan too!